I can’t stop! I love these beauties and pop them in my mouth every chance I get. 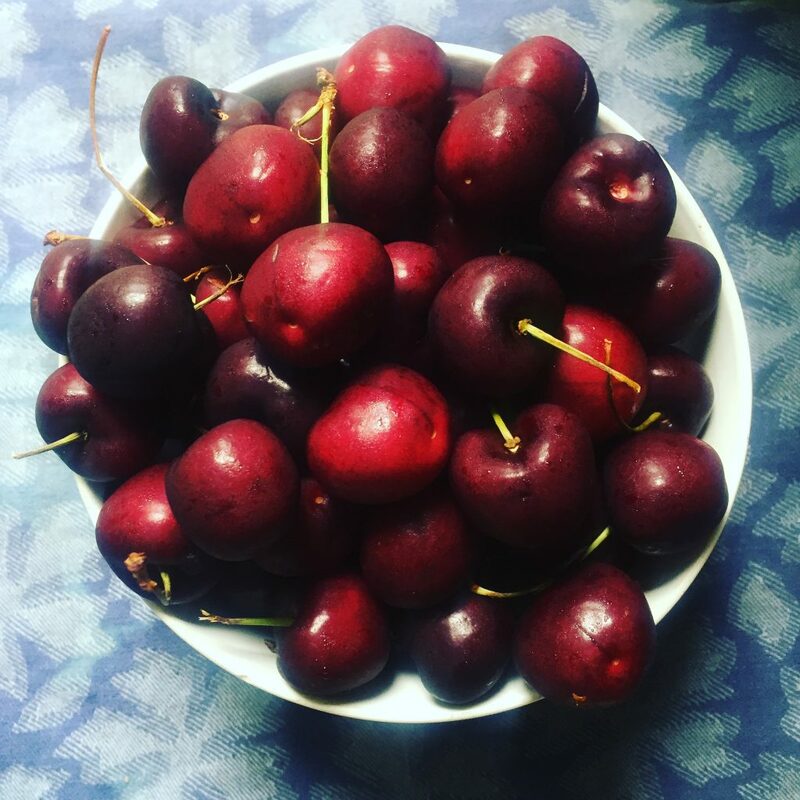 Cherries are just so SUMMER. 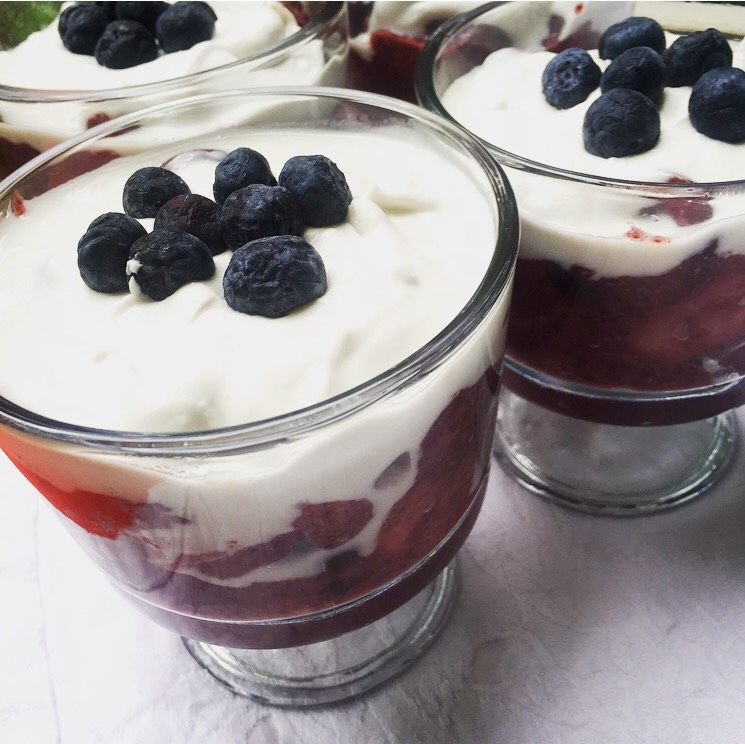 I saved some for this AWESOME July 4th dessert I made for the family cookout. The July 4th holiday weekend is always such a big food day. Personally, Independence Day is my 2nd favorite holiday (right after Thanksgiving) when it comes to eating. I just LOVE all the fun picnic decorations, parades, red white and blue apparel, and fireworks but the food always wins. 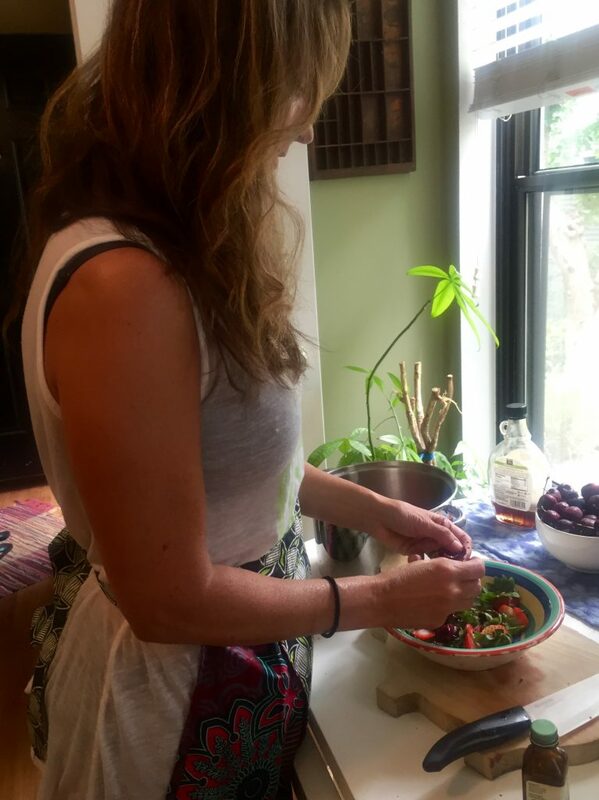 Summer can be a challenging time for clean eating (no shocker here) so instead of letting it all go, I make a few items that are “cleaned up” to balance things out. For example always bring watermelon to a party. If you want to nibble and need something filling and light, go with watermelon. Watermelon has high water content and hydration is a great way to beat bloat and feeling stuffed. You can make fun watermelon stars with cookie cutters, top with coconut flakes and blueberries for the July 4th vibe. And you can’t go wrong with Veggie Burgers. They aren’t greasy and have lots of fiber to keep you satisfied and away from the extra chips. Okay, back to dessert. Since cherries are abundant in summer, why not take advantage and make the Cherry Bombs? This dessert is off the hook YUMMO! Plus the bombs are clean and sugar-free. 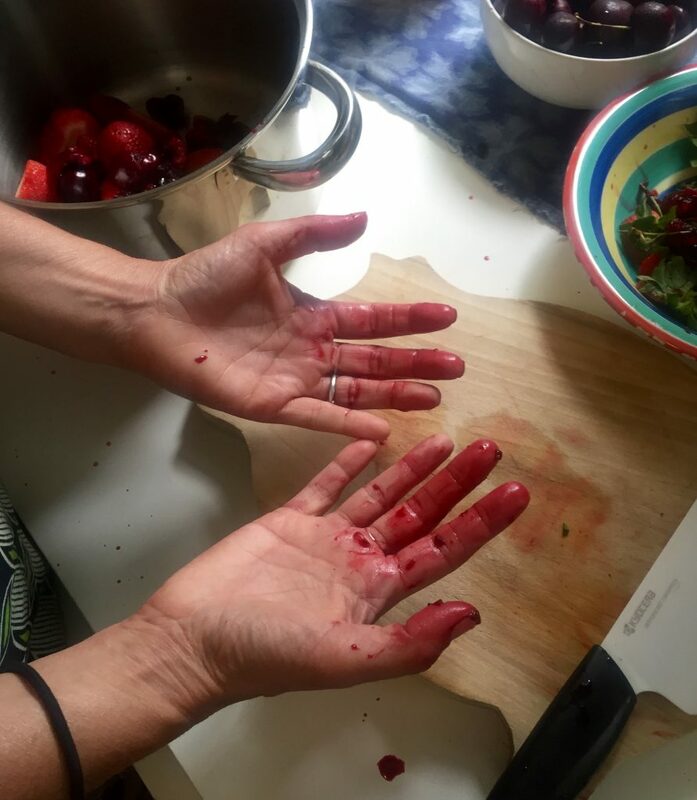 Heads up… if you don’t want to take the time to pit the cherries like I did, use frozen ones. It’s not a lot of work like I expected, however, so enlist in some help (thanks to my Kate!) and you’ll get the job done in just a few minutes. Chill time 1-3 hours, depends on thickness of coconut cream… the thicker, the less fridge time. Chill the cans of coconut milk in the fridge for at least 8 hours ahead of time so the coconut cream can solidify. 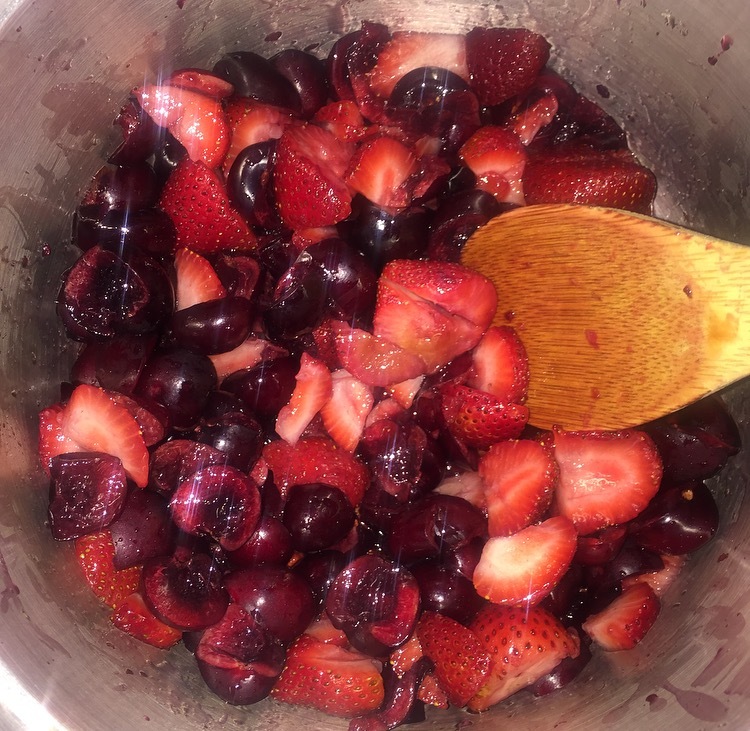 For the chia seed jam: Add the cherries, strawberries and maple syrup into a medium saucepan. Stir to combine. Increase heat to medium, and simmer until the berries release their juices and soften, about 5 minutes. When the berries look a bit soft, stir in the chia seeds. Keep cooking over medium heat until the chia thickens the mixture, about 5 more minutes. Remove from heat and stir in vanilla and lemon juice. Pour into a glass, cover and chill in fridge for an hour. For the coconut cream: Open the cans of coconut milk and scoop off the white coconut cream and place it into a medium bowl. There might be some left over coconut water so save in a mason jar for a future smoothie. With a whisk or a big spoon (I used this) , beat the cream in the bowl until smooth. Whisk in the vanilla. Enjoy immediately or cover and transfer to the fridge until ready to serve. 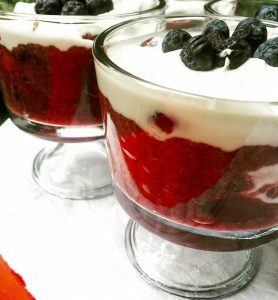 The chia seed jam and coconut cream keep for approximately 5 days (if covered). The coconut cream was such a hit in my house. The kids were dipping all kinds of fruit in it. Even Kevin who isn’t a sweets person licked the bowl. I can’t wait to see your Cherry Bombs! If you are in the States, enjoy your holiday and party it up! What is your all-time favorite summer food? Do tell! PS. 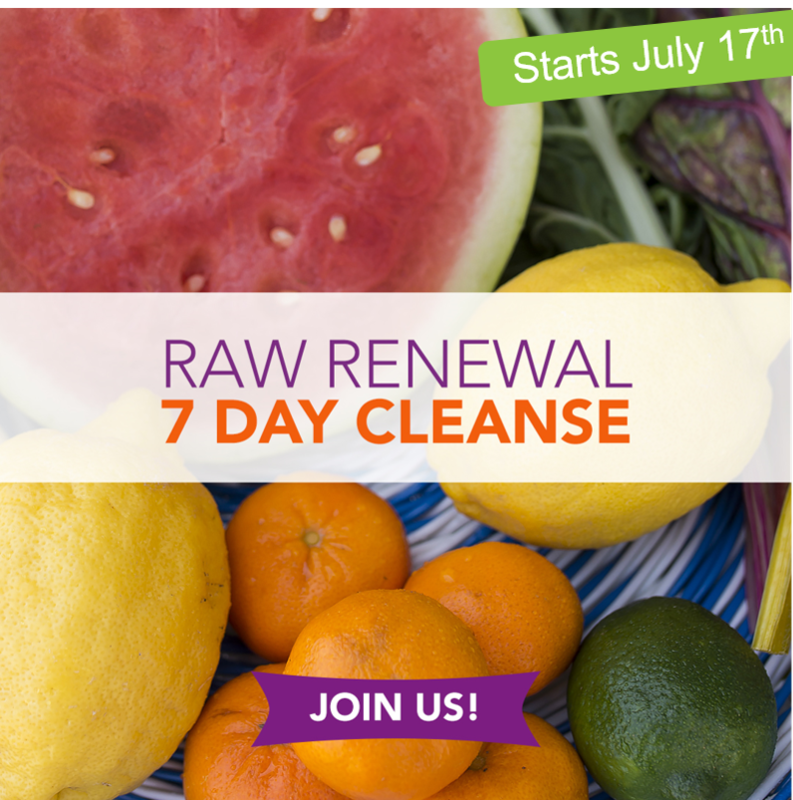 We start the LIVE groups summer cleanse July 17th! 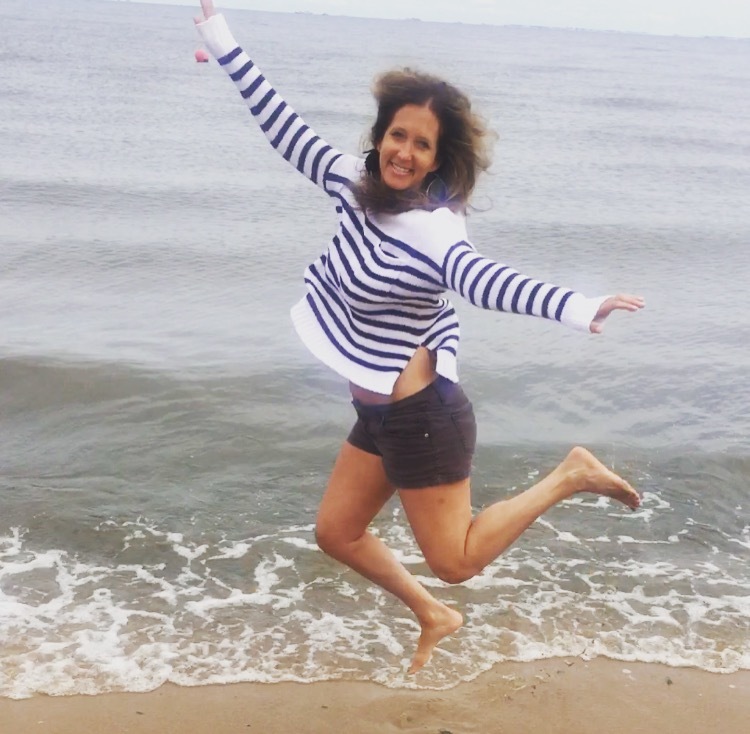 Lots of fruit, veggies and raw food… no sugar, no dairy, no pots or pans involved! 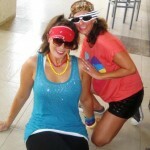 Join us for a quick 7 day detox and lighten up, energize and GLOW after the holiday fun. Ooooh this looks yummy and easy to make! I need to whip this one up! Sounds perfect! You are set and can’t wait to hear what you think!